Customize leak alerts to fit your water habits and adjust sensitivity while you’re away. Leak rules determine when you get notified about a leak. Flume creates two leak rules when you first install your device. We find that the majority of leaks are "low flow". Running toilets, slab leaks, pinhole leaks, etc. all fall into this category. Basically, this "low flow" leak rule will notify you if water is running constantly for a long period of time. In other words, your water usage never goes back to zero. By default, this rule is turned on, and it will let you know if water is running constantly for two hours. However, if you irrigate longer than two hours, you should change this rule so that this amount of time is longer than your longest irrigation cycle. So, if you irrigate for four hours, you should change this rule so that you will only be notified if water is running for more than four hours. Otherwise, your irrigation will trigger a leak notification. During installation, we ask you about your longest irrigation cycle. So, if you answered that question already, then this rule will already take your irrigation cycle into account. 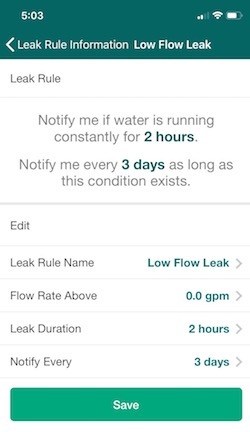 To view default settings of the Low Flow Leak notification, click on Low Flow Leak from Leak Rules screen. Default settings can be adjusted as necessary. See Editing Leak Rules below. High flow leaks are rare but they can cause a lot of damage in a short period of time. By default, this leak rule is turned off. If you turn this rule on, you may get some false leak notifications if you have anything in your house that uses more than 5 gal/min for a period of 15 minutes. If this is the case, you may want to monitor your water usage in the Flume app to see what your peak water usage is per minute. You can then bump up the flow rate to something more appropriate. To view default settings for High Flow Leak notifications, click on High Flow Leak from the Leak Rules screen. Default settings can be adjusted as necessary based on your water usage. In the screenshot at the top, you see a slider next to each Leak Rule. To turn a Leak Rule on, just depress the slider until it turns green. To turn a Leak Rule off, depress the slider until it turns white. To edit a leak rule, just click on the leak rule that you want to edit. To continue our example, we would then change the "Leak Duration" to "1 hour" and click "Save". To add a new leak rule, simply click on the "+" sign at the top of the page. If you are leaving your house, and you don't expect to be using any water while you are gone, you may want to set up a rule for Away Mode. This will notify you if any water is running for more than a couple of minutes. This could be very useful for vacation homes. Below is a good criteria to use for Away Mode.